Security and convenience are both key benefits of the smart home – but can you have them both at the same time? Is it possible to make it more convenient for yourself, your family, and trusted visitors to get in and out, without compromising your home's essential security? The answer is a resounding ‘yes', thanks to a set of advanced Smart Home security features called access control. It lets you conveniently manage who comes and goes, while actually enhancing security by keeping you aware of what's happening at home and in control of points of entry. You can control locks and garage doors, easily see if doors or windows are open or secure, and get reminders and alerts about what's happening around your home, all through a single, mobile app. You'll even get a notification if you leave home without locking your door – a situation that's easy to fix with remote locking and security system arming. It's time to get rid of that key underneath the mat with Alarm.com's Smart Home Security: the perfect blend of enhanced security and convenience. The door lock has evolved and gone keyless – and when powered by Alarm.com, it does way more than just let you in and out. As part of a Smart Home, your locks will work together with other devices, and with Alarm.com you can easily create rules – such as automatically locking your doors when you arm your security system – making it easy and convenient to keep your home secure. Consider the all-too-common scenario of a contractor scheduling an appointment "between 8am and 11am". You can take the morning off of work – or, with Alarm.com, you can get on with your busy day. When your contractor calls your cellphone at work, remotely unlock the front door and disarm the security system so they can get to work. You can even pull up a live video feed of the living room on your smartphone to make sure the job is going as planned. Then, when they leave, simply re-arm the system and lock the front door. For your family and trusted, regular visitors, Alarm.com lets you create unique user codes to give people the freedom to come and go without sacrificing security or control. Each unique code works only during the times you assign. 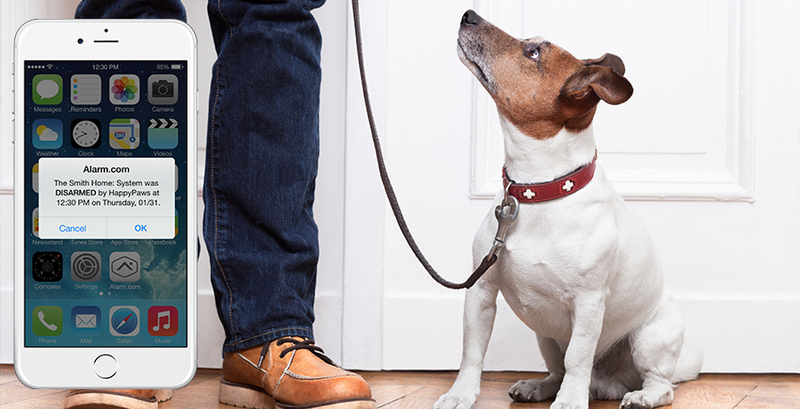 The dog walker can come and go during week days between 11am and 1pm, but the trusted neighbor you've known for years can get access anytime in case there's an emergency. It's far more reliable, convenient and secure than sharing a key (which you have to get made, and which will easily get lost). You can also create user codes that expire, making it easy to give a weekend houseguest access for their visit without having to worry about deleting the code when they leave. For total peace of mind when using smart access control, Alarm.com makes it easy to set up alerts telling you when a user accesses your home. You can use these in several ways – to always know when your kids are home safely from school, for example, or to ensure that your dog-walker is showing up on time. In fact, you can even set up no-show alerts. These are is great for regular service providers like cleaners or landscapers. You'll get a notification when they arrive and when they leave, as well as one if they fail to show at all. There are many other alerts you can set up for smart access control, including Geo-Services alerts which will let you know if you've left home without locking your doors (including your smart garage door) or arming your security system. When you receive one, you can simply secure your house remotely through your smartphone app. Click here to discover more about Alarm.com's smart access solutions – or click here to connect with a local Alarm.com security professional.